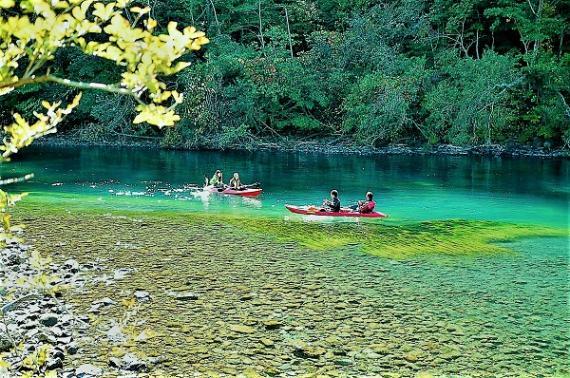 TOP [Summer]First in Hokkaido, our clear kayak tour in Lake Shikotsu, rated at number 1 for Japan's purest water for ten consecutive years ! 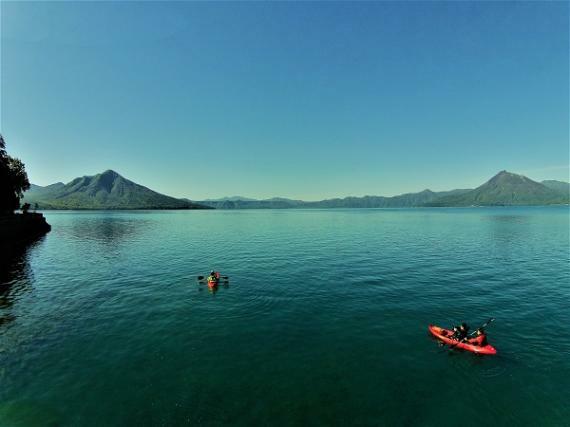 [Summer]First in Hokkaido, our clear kayak tour in Lake Shikotsu, rated at number 1 for Japan's purest water for ten consecutive years ! 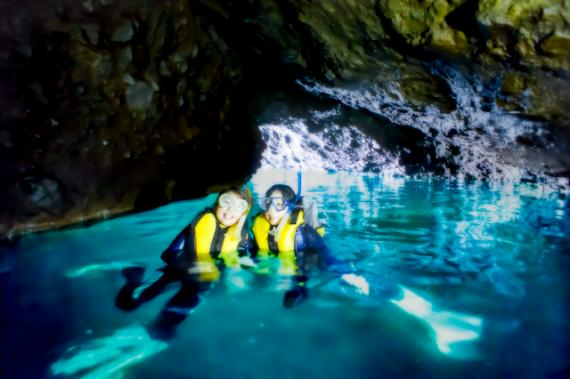 Our clear glass-bottom kayak tour, the first in Hokkaido. Experience the clear, crisp clear waters of Lake Shikotsu with this amazing craft, only 20 of which have been imported to Japan! Spring : Fresh snow melt runs into Lake Shikotsu. The lake is over 30 meters deep and the fish start to gather at the shore. All trees and mountain blossoms bloom, along with the flowers, heralding the first sign of spring. Summer: Gorgeous summer. Lake Shikotsu reflects the colors of its surroundings. You can see the local waterplants glowing beneath the surface of the lake along with thousands of fish. An underwater world of wonder. Autumn: Silence settles over the land as the leaves begin to change. The Kokanee salmon also miraculously changes colors when they begin spawning in mid-October. Winter: Lake Shikotsu slowly settles in for the long winter. Enjoy viewing the frosticles on the trees and other wild animals around the lake, which never freezes. Wintertime Lake Shikotsu is known to have the clearest water in Japan. 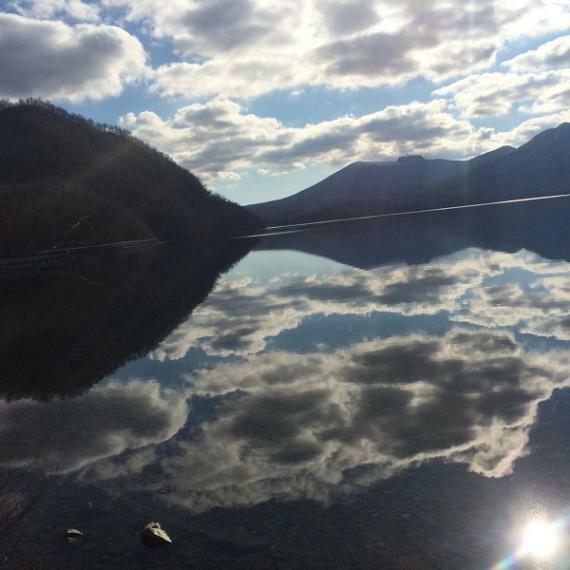 Lake Shikotsu offers awe-inspiring scenery throughout the year, both on land and underwater. It's the only place where you can spot Kokanee Salmon spawning in Japan. The Chitose River runs from Lake Shikotsu. Your tour starts at the point where the 'Blue River' shines in a mysterious blue color. 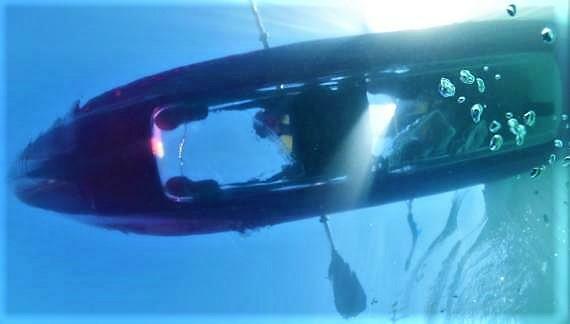 Look at this clear glass-bottom kayak! It gives you a strange feeling, as if you're both in and above the water. Lake Shikotsu is in Shikotsu Toya National Park. Beautiful nature awaits you there all year long. ※Free gift pictures taken during your tour. ・We can't always guarantee that they will be of the best quality, so please feel free to bring your own camera! If you plan to come by bus, please let us know. An early morning or sunset tour is also available upon request if the schedule allows. - Children 140cm and under can only participate during the July to September tours. - This program is not recommended for those who are pregnant. (Summer ) Wear comfortable, loose fitting clothes. Preferably easy-dry shirts, pants or sportswear, along with comfortable sandals or shoes with hard heels. (Spring/Autumn) Comfortable, loose fitting clothes. Long sleeve shirts, leggings or sportswear with tops and bottoms recommended. Bring along some warm outer clothing for extra warmth in May, June, October and November. A wet suit for added protection is available. Bring along warm outer clothing with thick socks. Portable heat pads are also recommended. Please set the destination on your car navi system for Shikotsu Lake. Guest house Shikotsu kamui is alongside the parking lot. Please note that the pick up & drop off service can accommodate only a limited number of people, and is not always available. ※ We conduct tours even when it rains or snows. Tours may be cancelled only if the weather is deemed to be hazardous. In that event, we will contact you by phone as soon as possible. ※ An onsen half price ticket is available for those who would like to go after the tour. Please let us know. ※ Winter participants: Please let us know your height,weight and shoe size for the wet suits. A rental fee is included in the price. Enjoy all four seasons in Hokkaido. Lake Shikotsu awaits to remind you of how great nature is. Come here to refresh your body and mind.